2. SWITCH INSTRUCTION: Hidden switch by the charging port. Press it to switch on.It starts with steady red light.With each press,it changes to another light mode. Press the switch for 11 times to turn the light off. If you do not need light, long press the button for 3-5 seconds to turn them off at any time. 3. CHARGE INSTRUCTION: Easy charge like your cell phone with the attached USB charging cable. Switch on the shoes when received and light up until all power gone.Then charge both shoes for 3 hours. Which can provide 8~11 hours of lighting time. 4. 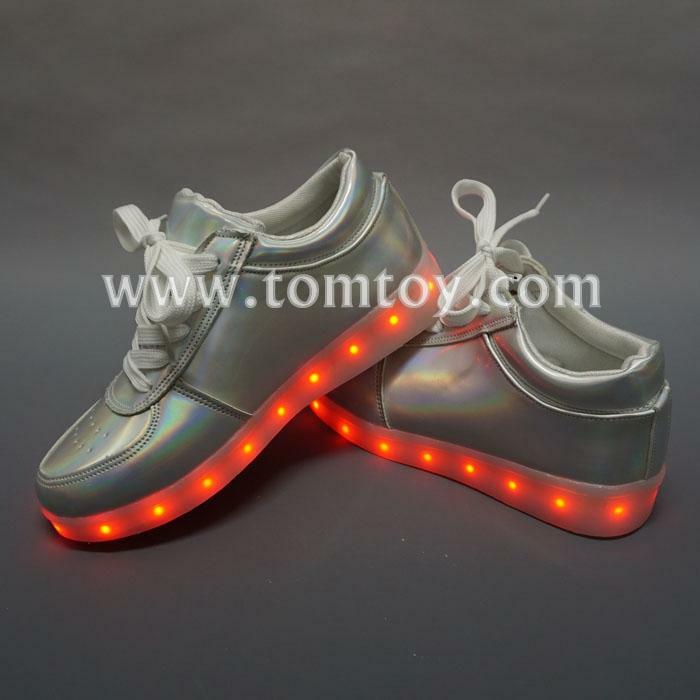 High-quality material, breathable, wear-resistant rubber soles, colorful LED light, which is the best gift for lovers and kids for birthday, performances, Halloween, Thanksgiving and Christmas Day and other celebration. 5. 7 solid colors options then there are 4 auto options. (Static colors include Red, Yellow, Green, Blue, Purple, Aqua, and White).The LED lights are bright and change colors to whatever you set them to. Colors and the variations of strobes are so bright and cool.